When we are at our most productive state, we are in a state of flow, sometimes also referred to as “being in the zone” or “being in the groove.” Flow refers to a state of total absorption in a given activity, to the point where time seems to slow or stop, and self-consciousness is greatly diminished. This is a state of being completely engaged in something to the point of being in a near meditative state. You can experience ‘flow’ when you’re doing creative activities that utilize your special strengths, like writing, painting, speaking or even number crunching. Certain aspects about our jobs lend themselves to flow, and when we experience this often, our work tends to bring greater job satisfaction. The concept of flow was first studied by Mihaly Csikszentmihalyi (MEE-hy CHEEK-sent-mə-HY-ee), a former chairman of the University of Chicago Department of Psychology and now at Claremont Graduate University. In his book Flow: The Psychology of Optimal Experience, Csikszentmihalyi describes the flow state as one in which an athlete or individual performs at his or her best, seemingly without effort, but with total concentration, feeling totally in control without thinking about it. Self-consciousness recedes into the background as total focus is upon present activity. Flow is completely focused motivation. It is a single-minded immersion and represents perhaps the ultimate experience in harnessing the emotions in the service of performing and learning. In flow, the emotions are not just contained and channeled, but positive, energized, and aligned with the task at hand. The hallmark of flow is a feeling of spontaneous joy, even rapture, while performing a task. It is also described as a deep focus on nothing but the activity – not even yourself or your emotions. Csíkszentmihályi identifies the following factors as encompassing an experience of flow. These aspects can appear independently of each other, but only together do they constitute a so-called flow experience. The most dramatic examples of flow come from sports, particularly high risk sports. In Steven Kotler’s The Rise of Superman: Decoding the Science of Ultimate Human Performance, he shares story after story of incredible physical and mental feats achieved by surfers, skiers, skateboarders, BASE jumpers – all who tap into their flow state and achieve something that has never been done before. So flow is not just to help us “feel good about our work” but it can help us achieve great innovative or creative feats. The physical setting that supports flow at work can vary by individual, so to accommodate it requires not only a variety of settings but the ability for employees to pick and choose the environment that works best for the task at hand. Some people will choose to work in an enclosed, quiet space to work while others prefer the background noise and buzz of a coffee shop. It is also critical for tools such as pens, paper, post-its, etc and technology, like powerful wifi, large display monitor(s) and access to power are easily accessible. Breaking the flow of thought because you have to leave to find a marker that works can be detrimental. Though there are many professions that require flow for individual tasks, there are few that depend on it more than writing. Interestingly, writers seem to have honed down their “writing lairs” over the years to capture the flow experience beautifully. 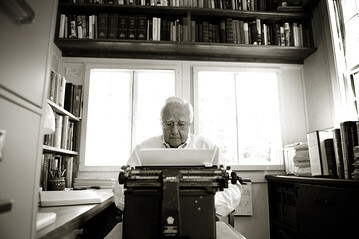 David McCullough is an American author, narrator, historian, and lecturer. He is a two-time winner of the Pulitzer Prize and the National Book Award and a recipient of the Presidential Medal of Freedom, the United States’ highest civilian award. His books, John Adams and Truman have been turned into films and mini-series. 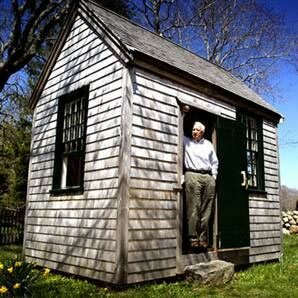 McCoullough has written all of these great works in a tiny shed he build in his backyard behind his house in Martha’s Vinyard. 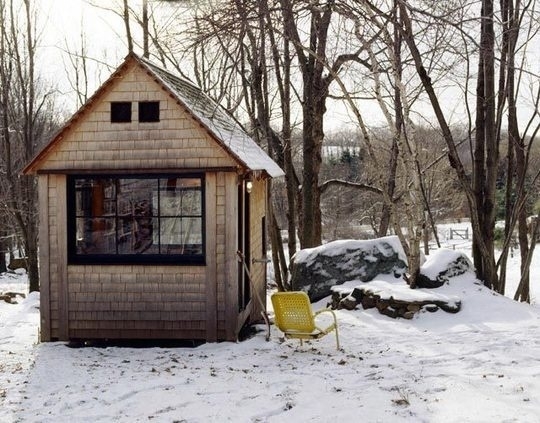 Known as “the bookshop,” the shed does not have a telephone or running water. Its primary contents are a typewriter, a green banker’s lamp, a desk and a few books and papers. To keep from being startled while working, McCullough asks his family members to whistle as they approach the shed where he is writing. Here is another example of Michael Pollan‘s writing hut, author of Omnivores Dilemma and several other ground breaking works. Apparently he built this structure himself in the woods behind his Connecticut home. In the workplace, we can fairly easily replicate spaces like these, with good acoustical barriers, views to the outside and located in places away from disruption. The problem is of course, is that most of us still do a chunk of our work with other people, not just by ourselves, and in teams. So most of us need spaces that support “group flow” too. In business, some of the best examples of flow are small start-up groups or smaller groups within a larger organization who have autonomy and limited hierarchy within the group. The physical environment that supports flow embodies many of these triggers. For example, spaces for flow are likely controlled by the group using them, are flexible and “open” at least to members of the group. 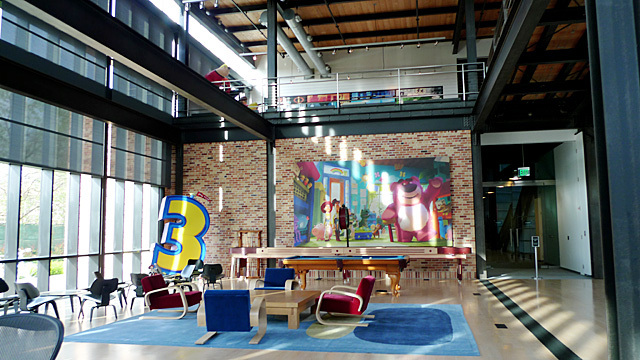 These spaces likely allow for some improvisation or movement of furniture or technology and do not support hierarchy. To illustrate, researchers at Washington University in St. Louis used biometric devices and other measurements to understand how group creativity and engagement might increase or decrease based on changes to the physical environment. They were effectively studying group flow (though I’m not sure they intended to). The researchers did an experiment with student subjects that were split into two groups. Both groups were put in a conference room and asked to come up with a short promotional video for their school in 30 minutes. The first group did this exercise sitting around a conference table and the second group had no chairs, and did the exercise standing up. The researchers found differences in the creativity and execution of the videos between the two groups, but also the social dynamics in the room. Individuals in the standing group were more engaged, more likely to toss out their own ideas and pick up on a better one from someone else and there was less hierarchy in the room. As a result, the quality of the videos was much higher. The physical change of removing furniture and allowing teams to work more dynamically in the room dramatically changed the creative output. An example of space that supports group flow really well is the “black box” theater. The black box is highly flexible and allows for an infinite number of performance styles and gatherings, depending on the need. 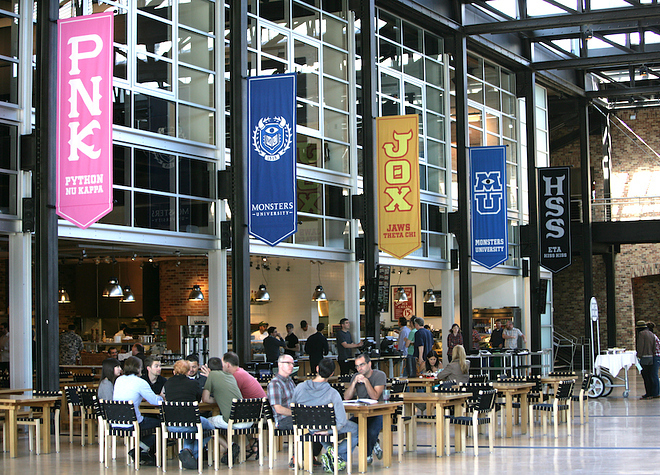 the main gathering spaces in Pixar’s offices have that look and feel, and apparently support group flow and collaboration across teams successfully. The take away for me here is that places that positively affect creative flow need to pay attention to the psychology of individuals and teams. A “flow inducing” workplace has to be more than just cool. It must be designed with the right mix of individual and collaborative areas, less hierarchy, careful attention to acoustics, plenty of opportunities for user control and a certain amount of freedom and flexibility in how it is used. Turns out, the setting for creativity is actually much more prescriptive than you think.